In January, the seventeenth Commonwealth Conference was held in London. Our Regional Editor for the United Kingdom was again invited by the Secretary-General to attend a special meeting to put questions to the Prime Ministers and diplomats attending the Conference. Here is his analysis of that meeting and of today's divided Commonwealth! COMMONWEALTH meetings used to be times when the great British-reared "family of nations" came together for frank but cheerful discussions. Today's Commonwealth Conferences are far from occasions of jubilation. No longer are these Conferences friendly "family reunions." 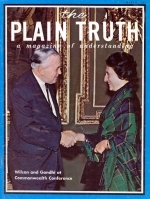 The sixteenth (1966) Commonwealth Conference all but broke up over differences in how to handle the Rhodesian problem. This year's seventeenth Conference wasn't quite so stormy. But it was quite evident that there is still much contention over such thorny Commonwealth problems as the Rhodesian question, the Nigerian-Biafrian conflict, and the touchy racial immigration issue! How can these — and other — knotty problems be solved in such a way as to preserve real peace, harmony and cooperation between members of this Commonwealth of Nations? Today's Commonwealth, remember, is made up of a motley assortment of twenty-eight nations — representing over one-fourth of the earth's peoples and land surface. I was invited to attend a special informal meeting of the Prime Ministers of today's Commonwealth. Speaking to a number of Prime Ministers — Mr. Trudeau, Mrs. Indira Gandhi, Dr. Kaunda, and Dr. Makarios — I learned, firsthand, their reactions to the sticky problems which confront today's multicolored, divided Commonwealth. The Secretary-General, Mr. Arnold Smith, and the Prime Ministers to whom I spoke, know that the big problems confronting the Commonwealth all revolve around the racial issues, or barriers, which do exist in today's multiracial Commonwealth. Mr. Arnold Smith reported to the Commonwealth Conference in 1966 that the whole world was watching to see if the member nations of the Commonwealth could cooperate effectively across racial barriers. He pointed out at that time that the real crux of the Rhodesian problem was whether or not the diverse races of mankind could get along together. The whole world was, he said, watching to see whether or not the multi-racial Commonwealth could survive — and prosper! Mr. Smith recently told me that, despite serious differences, he didn't think any disgruntled members were seriously thinking about leaving the Commonwealth at this time. The Commonwealth Secretary-General said that this meeting was being attended by 24 Heads of Governments, while only four Commonwealth nations didn't send their Heads of State — just sent representatives. He said he thought this was the largest meeting of Heads of State since the 1947 San Francisco Conference. Mr. Smith spoke of the "disenchantment between the races" which make up today's multi-colored Commonwealth. Many believe India is being subverted by communism. Communist gains in India's February elections lend weight to that conviction. But India's Prime Minister, Mrs. Indira Gandhi, told me she didn't think her country was in danger of a communist take-over — as had recently been hinted by the British press. Just before the January Commonwealth Conference began, reports in British newspapers, radio and T.V. were saying Mrs. Indira Gandhi had even said that India might leave the Commonwealth. This she later denied. But there can be no doubt that the Commonwealth's most populous country, India, is beset by many problems, and is slipping in the direction of communism. Zambia's Prime Minister, Dr. Kenneth Kaunda, refused to attend the 1966 Commonwealth Conference because of a serious disagreement with Britain and other members of the Commonwealth over how the 'Rhodesian rebellion" should be handled. Dr. Kaunda favored military intervention by Britain and other Common wealth members. Most of the Commonwealth knew that an attempted military solution could have set all Africa ablaze in a nightmarish racial war. Rhodesia, the Republic of South Africa, Mozambique (and possibly even Portugal and other nations) would certainly have joined forces to resist any armed attempt to overthrow the Smith regime. The outcome of such a military conflict could have been fraught with more danger than the Vietnamese conflagration! Britain and other members of the Commonwealth could see this and wanted to avoid a direct military confrontation with Rhodesia and her loyal allies. Besides, Britons weren't eager to kill their own "kith and kin" in Rhodesia. When I spoke to Dr. Kaunda at the recent Commonwealth Conference, he gave me the impression he had never fully forgiven Britain for not intervening to overthrow Mr. Ian Smith's government in Rhodesia. The members of the Commonwealth are generally agreed that Mr. Smith's U.D.I. (Unilateral Declaration of Independence) was "illegal" and they all wanted to see Mr. Smith's government overthrown — but no Commonwealth nation wanted to have the expense, trouble and bloodshed necessary to bring about such a large undertaking. The Commonwealth members are like the "council of mice" who, according to Aesop's Fables, once got together to consider what to do to protect themselves against the menace of a certain cat who had the obnoxious habit of eating mice. During the council session one bright mouse popped up with the brilliant suggestion that a bell be put around the neck of the offending cat. This would warn all the mice when the cat was approaching. Every mouse in the council loudly applauded the idea. But one wise old mouse dampened their enthusiasm considerably by asking one penetrating question: "Who is going to put the bell on the cat?" This question quickly dissipated all of the mice's applause and enthusiasm. None was quite prepared to accept so formidable a challenge. So it is with the members of the Commonwealth toward the Rhodesian lion! Dr. Kaunda recently told me that he still strongly believes Britain should take steps to see that Mr. Smith's government is overthrown — by military force if necessary. He then said he feels less bloodshed in Africa will result from this course of action, than if nothing is done until a very hot, bloody racial war engulfs all of southern Africa. He has even offered his country, Zambia, as a launching-base for Britain to use in overthrowing Rhodesia. Many African states are certainly disturbed by the continuing prosperity and growing strength of Rhodesia — where about 225,000 white, European-descended Rhodesians rule over 4,000,000 Rhodesian blacks. Having travelled throughout Zambia and Rhodesia, I feel that I pretty well understand the racial conflict of that continent. The European Rhodesians see what occurred in the Congo, in Ghana, Kenya, Nigeria and other African-run nations — and they are simply not prepared to lose all they have struggled to build up through the centuries. They point to the fact that the Africans are better off in nations like South Africa and Rhodesia where the whites are still masters. They shake their heads, saying they are not about to turn the reins of government over to the Africans whom they argue are nowhere near qualified to run their own national affairs. Thus the black and white members of the Commonwealth are deadlocked over the solution to the Rhodesian impasse — are quite unable to untie the tangled Rhodesian knot. Mr. Trudeau, Prime Minister of Canada, told me that he and his government are seriously considering taking Canada out of NATO. He said he is more concerned about "national unity" in Canada than anything else. Mr. Trudeau, himself of French and British ancestry, is very anxious to solve Canada's racial unity problems. Does Canada support the doctrine of armed intervention in Rhodesia? If Canada isn't even willing to remain in NATO, certainly she couldn't be counted on to supply troops to fight against her own white Rhodesian relatives thousands of miles away. Most of today's biggest Commonwealth problems all revolve around the explosive issue of "race." This sad, poignant fact keeps throwing itself in the face of today's divided Commonwealth. What is the Commonwealth? When did it begin? What useful purpose, if any, does it serve today? What is its future? Today's Commonwealth of twenty-eight self-ruling nations is actually an outgrowth of the once-proud British Empire, originally consisting of many territories ruled by Britain. Sir Kenneth Bradley, CMG, Director, Commonwealth Institute, thus defined the Commonwealth: "The Commonwealth is a voluntary association of independent nations consisting of Britain and those countries which were formerly in the British Empire or had been Protected States in treaty relations with The Crown." Sir Kenneth says that it is not just "a prolongation of the Empire." "It is an experiment in living together by many different peoples who share a common heritage of ideals and institutions..."
He then points out that the peoples of the Commonwealth "belong to many races and religions, and speak a multitude of tongues; they comprise more than a quarter of the world's population, and they occupy a quarter of its land surface." Sir Kenneth continues: "Before 1947, when the Commonwealth consisted of Britain and the old "White Dominions," its statesmen thought of it mainly in terms of political relations, defense and trade. It was very much a family affair..."
Today's Commonwealth is a "very loose association" of nations who have acquired, through their long association with Britain, a common heritage of ideas and institutions, and there is, of course, the English language which helps bind them together. The Queen of England is the only formal link which binds the Commonwealth together. Each country is voluntarily a member, and has the option of leaving the Commonwealth at any time. No member of the Commonwealth is permitted to interfere in the internal affairs of the other members. It may surprise some to learn that the Queen is also the actual "Head of State" in the following Commonwealth countries: Britain, Canada, Australia, New Zealand, Barbados, Ceylon, Guyana, Jamaica, Malta, Mauritius, Sierra Leone and The Gambia. Malaysia, Lesotho and Swaziland have their own monarchs. All other members are republics, and Tanzania has a "one-party" system. The history of the British Empire is a fascinating one. It can be truthfully said that Britain didn't really plan to become the master of her far-flung Empire. But it nevertheless grew until it finally reached gargantuan proportions. A close scrutiny of British history will show that comparatively little British blood was shed in the acquiring of the vast, far-flung territories which eventually made up her Empire. It is an undisputable fact that Britain acquired most of her Empire by colonization, and by treaties. It was primarily through seeking greater outlets for trade and commerce, and through the missionary zeal of her subjects, that Britain acquired her Empire. As an example, very little blood was shed by Britain in acquiring the vast country of India with its hundreds of millions of peoples and its almost-unlimited resources. In reality, Britain acquired authority in India in order to stop bloodshed. At the turn of the 20th century Britain had established herself as the undisputed mistress of the seven seas. Furthermore, she had gained control of nearly all of the strategically important, international sea gates which controlled the sea lanes of the whole world. Britannia ruled the waves! Nobody dared challenge her. The actual beginning of the self-ruling Commonwealth nations dates back to Lord Durham's famous report of 1839. This report thoroughly analyzed the causes of discontent in the Canadian colonies. It was feared the Canadian unrest might cause these colonies to follow the example which thirteen other North American colonies had taken about 60 years earlier. Unless something were done, and done quickly, the Canadian colonies might secede from Britain — as the thirteen U.S. Colonies had done — and also declare themselves independent. Britain didn't want this to happen. Lord Durham proposed that in the future the Governor should appoint Ministers who had the complete confidence of the local assembly and that he should accept the views of the assembly — except in certain matters particularly affecting relations with the "Mother-country." Thus by 1846 this recommended system of "responsible government" was already operating in Canada; soon afterward, it was extended to Australia, New Zealand, South Africa and to the other North American colonies. These British-run colonies or "White Dominions" became more and more autonomous as the years passed. They wanted more freedom — more liberty to run their own affairs. The Imperial Conference of 1926 described Britain and the Dominions as "autonomous communities within the British Empire, equal in status, in no way subordinate one to another in any aspect of their domestic or external affairs, though united by a common allegiance to the Crown and freely associated as members of the British Commonwealth of Nations." The Statute of Westminster in 1931 gave these Commonwealth nations still more freedom from the "Mother-country." The British Commonwealth of self-ruling nations really came into being — legally speaking — in 1931. Seven nations made up the Commonwealth at that time: Britain, Canada, Australia, New Zealand, South Africa, the Irish Free State and Newfoundland. This, then, was the old "white Commonwealth." Mr. Arnold Smith, Commonwealth Secretary-General, made the following significant statement in 1966: "Once the Commonwealth was a very small and homogeneous [all of the same race] group of nations, all mainly of European origin, all relatively rich." But what is it today? It has changed drastically since its formation in 1931. Many peoples of other races have been invited to exchange territorial status for Commonwealth membership. Mr. Smith continued, describing today's Commonwealth: "It is now a typical cross-section of mankind and its problems. The association includes representative and important peoples from virtually all the main races, in all the continents, with a tremendous range of cultural traditions and of economic potentialities and problems, at every stage of development. It includes very rich countries and very poor ones, very large nations and very small." Why was this "family of nations" originally called a "Commonwealth of nations"? Simply because the national birthright heritage of the old, "White Commonwealth" of nations was one of fantastic wealth! Britain, Canada, Australia, New Zealand, and South Africa were all very rich nations — compared to most nations of the world. They possessed a large share of the earth's best land, large deposits of minerals and other natural resources. They were peopled mostly by talented Northwest European peoples who had the ability and the energy to develop the fabulous WEALTH of these Commonwealth nations. Yes, most of them shared a common language (English), a common racial heritage, a common law and educational system and a common wealth! The Irish Free State (Eire) left the Commonwealth in April 1949. It became the Republic of Ireland. Newfoundland became Canada's tenth province in 1949, thereby ceasing to be an independent member-nation of the Commonwealth. And South Africa withdrew from the Commonwealth — following Commonwealth criticism of its apartheid racial policy — in May, 1961 and became the Republic of South Africa. The Commonwealth, originally composed of only seven loyal member-nations of about 50,000,000 people, gained many colored member nations to replace the white members that were lost. But most of the present members aren't loyal to Britain in the same way that the old, "White Commonwealth" was. Today's 28-nation Commonwealth has a total population of about 800,000,000 and encompasses about 14 million square miles! Since the end of World War II Britain has granted independence to over 30 British dependent territories — comprising a population of well over 700,000,000. Britain began granting independence to her Imperial possessions in 1947. In that year India and Pakistan were granted independence, and accepted the invitation to join the Commonwealth family. Almost overnight, the white, rich, mostly Anglo-Saxon-Celtic Commonwealth had been transformed into a predominately dark (colored), poor, non-European association of "Commonwealth nations." But the majority of Commonwealth subjects from that day forward didn't really share in a Common WEALTH. The vast majority share a common POVERTY. Just before the Commonwealth Conference began, a leading British paper asked: "Should we roll out the red carpet and cheer when the Commonwealth leaders arrive in London this week? Sadly, no. For the truth is that several of those who are coming have not the slightest loyalty either to Britain or the Commonwealth." The author of the above statement then went on to say that Mrs. Gandhi had just said that India would remain in the Commonwealth only just as long as she could get something out of it. "She [Mrs. Indira Gandhi], like Dr. Kaunda and several others, is coming not to help us, but to stir up trouble by urging that we should make war against Rhodesia. Those countries have no ideals in common with us." This same article then went on to point out that many of the Commonwealth countries insist on voting against Britain in the United Nations — where 12 Commonwealth nations recently either voted against Britain, or else abstained. Each year Britain spends about two hundred million pounds ($500,000,000) in foreign aid — mostly on members of the Commonwealth. Besides this, another two hundred million pounds of private capital are spent on these countries annually. Since World War II, Britain has spent about 350 million pounds on grants, gifts and various types of aid to the Commonwealth countries — nearly all in outright gifts. This is what Britain, the "Sick Man of Europe," has been doing to help the developing countries — all at a time when Britain can ill afford to help anyone because of her chronic balance-of-payments crises which keep occurring with the regularity — and sometimes it would seem almost with the frequency — of the setting sun. A London paper recently mentioned that Britain should tell other members of the Commonwealth that they really want to maintain the "spirit of kinship" of the Commonwealth. That the members of the Commonwealth must be prepared to extend towards Britain the same sympathy and understanding which she extends towards them. "And, if these warnings are ignored, we should in due course opt out of the present Commonwealth altogether. In the hope that other members of like mind will opt out too — to form a smaller grouping based on common ideals" — said this paper. Many in Britain are beginning to see that today's multi-racial Commonwealth has been a constant drain and strain on Britain. This motley Commonwealth is proving to be a pretty lopsided affair for Britain especially. But Britain, with utmost patience, has continued to delicately walk the Commonwealth's racial tightrope. Britain hasn't fallen off — yet! But South Africa did fall off that racial tightrope, and Rhodesia appears to be about ready to declare herself a Republic, and would undoubtedly have to leave the Commonwealth shortly thereafter — because of strong racial criticism from other members of this motley, British-founded club. Many in Britain keep asking: "When will Britain become the mistress of her own destiny? When will she ally herself more closely with the old 'White Commonwealth' — who really do have so much in common, insofar as race, religion, language, laws and customs, government, etc. are concerned — and let the other disgruntled members of the Commonwealth go their own way? Let them then fend for themselves." Many in Britain are tired of letting some of these Commonwealth members "kick them around," especially at the U.N. Britain is getting tired of picking up the check, always, while ungrateful members of the Commonwealth grumble and complain — yet are always wanting Britain to bail them out of their difficulties! These red-blooded Britons would just as soon see Britain try to rebuild her links with the old, "White Commonwealth" and forget about the "ungrateful newcomers" who have joined the club since 1947. Zambia's Prime Minister, Dr. Kaunda, has even gone so far as threatening to have Britain expelled — expelled from the very Commonwealth which she built up over the centuries. It looks like Britain's unruly, delinquent children have very little respect for their Mother. Once upon a time the Commonwealth was strong — meant much to all its members. Things are different today. India's former Prime Minister Nehru once called the Commonwealth: "A rather strange and odd collection of nations which has found some kind of invisible link by seeing that practically there is no link." But he was referring to this new, mainly colored Commonwealth — not the old, "White Commonwealth." Many have not realized that today's Commonwealth is responsible for over one fifth of all world trade; and that about one third of the world's international payments are still financed in sterling. All Commonwealth countries (except Canada) belong to the sterling area — plus a number of nations who aren't members of the Commonwealth: The Irish Republic, Iceland, Jordan, Libya, Kuwait, South Africa and South West Africa, Western Samoa, the independent Sheikhdoms of eastern Arabia and the People's Republic of South Yemen. When Britain declared war in World War I and II, the Old Commonwealth nations were automatically drawn into the fracas. Not so today. It is true that there are a number of defense treaties existing between the various members of the Commonwealth. Neither Britain nor any other country has the power to automatically involve the other nations in any national dispute with another Commonwealth nation. Britain was powerless to intervene in the war between India and Pakistan. They turned, rather, to Russia to help them settle their differences. It is true that the Commonwealth governments, whatever their differences, still do work closely together in many ways: Here are a few fields in which they help each other: education, medicine, law, administration, scientific research, industrial planning, marketing techniques, architecture, agriculture, forestry, the arts, broadcasting and tourism. And there are many benefits which accrue from being a member — especially if you are one of the poorer, under-developed and technically untrained nations. Most of this assistance is a one-way street — going out from Britain to these developing countries. It is true, as Sir Kenneth Bradley put it, that the Commonwealth "exercises a stable force in the world" and is of some value in "bridging the gulf between the races and the gap between the developed and the developing world." Sir Kenneth denies that the Commonwealth is "a meaningless facade." What will happen to today's sprawling, multi-racial, seemingly impotent, disunited Commonwealth? Almost two thousand years ago a very wise man enunciated a principle which applies to today's divided Commonwealth: "Every kingdom divided against itself is brought to desolation; and every city or house divided against itself shall not stand" (Matt. 12:25). The unruly, undisciplined children lost respect for the "Mother-country" years ago — and are sadly divided! Though Britain continues vainly, gingerly to walk the Commonwealth's racial tightrope, great difficulties lie ahead. British home legislation restricting colored immigration into Britain has only increased hostility from certain colored member nations. What can Britain do? Can she please all this motley assortment of undisciplined nations? Will they really listen to her voice? Or, has the "British Lion" lost much of its growl so that it is no longer feared and respected in other nations, or even in the Commonwealth itself? Was Dean Acheson right when he said that Britain had lost an Empire, but hadn't been able to find her world role? And it also disturbs some of these red-blooded Britons to see that the very Mother-country of the Commonwealth has lost nearly all control over her very undisciplined children. But, as for most Britons, they couldn't care less — so long as they can have the good life — plenty of beer, cigarettes, food, a "telly" — and can crowd into the gambling places and amusement centers so they can forget the past glories of a faded Empire. The younger generation of Britons are bored to tears with Britain's "great and glorious past." Only a very few Britons have learned the lesson of General Gideon, the Commander-in-chief of ancient Israel's army. He cut his army down from 32,000 to only three hundred. Better to have a few select brave ones who are dedicated, wholeheartedly, to the cause — than 750,000,000 critics and complainers who always have their hand out — but are not willing to put their shoulder to the wheel to do their vital part. Will Britain learn her lesson? Will she yet be able to salvage the Commonwealth — and turn it into something of substance — something really worthwhile for herself and for all members of the club? Can Britain infuse the Commonwealth with spark, muscle, spirit — with new life? The United States and the British Commonwealth in Prophecy, and The Wonderful World Tomorrow - What It Will Be Like. These books will reveal how the Anglo-Saxon-Celtic-descended peoples of the British Commonwealth of nations — after first learning a vital lesson — will yet be instrumental in helping the peoples of India, of Africa and of many nations to overcome their poverty and ignorance and attain wealth and true greatness in the wonderful world tomorrow!